EghtesadOnline: Uncertainty is in the air these days for Iran’s financial markets, especially stocks. Recent upheavals in the foreign exchange market, coupled with the looming political risks, have all but paralyzed investors and tilted the markets toward bears. This is now, in fact, an opportune time for portfolio restructuring, as certain share prices are at their all-time low. But the uncertainty surrounding the fate of the 2015 nuclear deal, also known as the Joint Comprehensive Plan of Action, has hamstrung trading. 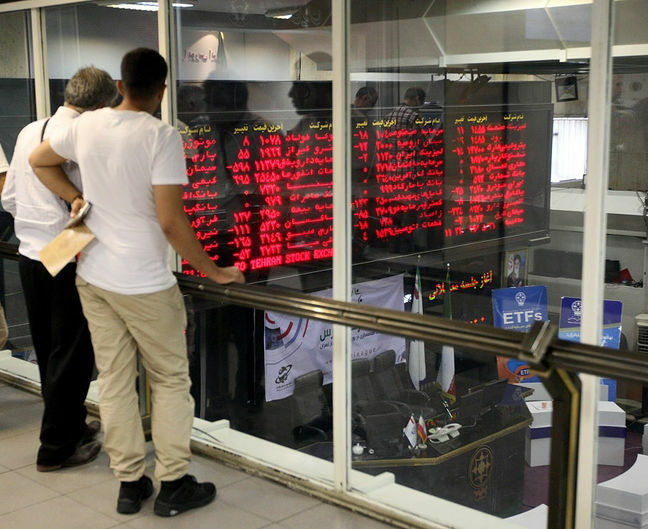 Overall, Tehran Stock Exchange’s main index TEDPIX lost 1,184 points or 1.2% during the week that ended on March 2 to close at 93,612.1, according to Financial Tribune. Iran Fara Bourse’s benchmark index, IFX, also dropped 3.7 points or 0.3% to stand at 1,057. US President Donald Trump has all but decided to withdraw from the nuclear accord by May 12, but exactly how he will do so remains unclear, according to two White House officials and a source familiar with the administration’s internal debate, Reuters reported. Technically, Trump must decide by the deadline whether to renew “waivers” suspending some of the US sanctions on Iran, including sanctions on Central Bank of Iran and the Islamic Republic’s oil sales. One of the White House officials who spoke on condition of anonymity said it was possible Trump will end up with a decision that “is not a full pullout” but was unable to describe what that might look like. Europeans still want to save the deal by coming up with a plan to satisfy Trump’s concerns with the accord, but they have also started working on a plan B to protect their interests in Iran if the US does withdraw, six sources told Reuters. The Iranian economy did not get as much as it wanted out of JCPOA, considering that secondary US sanctions remained in place since the deal’s inception. The prospect of the deal going down, however, could make things much harder. Hence, the markets’ paralysis is justified, and anyone expecting a change should start counting down in the runup to the May 12 deadline. The recently unified rial/dollar rate at 42,000 has proved to be quite illusive as virtually no one is selling USD at that rate in the open market. Official market observers, such as Tehran Gold and Jewelry Union, have consequently ceased to update USD price on their website. This is while the greenback is being unofficially traded at more than 61,000 rials on the black market. Euro, however, has not been pinned to any fixed rate and the benchmark Bahar Azadi gold coin fluctuates freely, highlighting the non-existence of 42,000 USD/IRR rate. The benchmark gold coin rebounded last week and gained a total of 8.79% in value to 18.75 million rials, after a 2-3% drop the week before last. The coin gained all week, with its sharpest uptick happening on Thursday, putting it only about 350,000 rials away from its all-time high. Euro, too, had a winning week against rial, as it gained 7.22% to 73,140 rials by Thursday’s close, according to Tehran Gold and Jewelry Union’s data. Tuesday and Thursday accounted for most of the gains for the week. Over 2.35 billion shares valued at $144.6 million were traded on TSE last week. The number of traded shares and trade value dropped by 42% and 36% compared to the week before. TSE’s First Market Index lost 1,659 points or 2.4% to end at 666,464.8. The Second Market Index also dropped by 4,147 points or 1.93% to close at 210,189. And at IFB, over 797 million securities valued at $192.4 million were traded, with the number of traded shares dropping by 6% while trade value grew 9% compared to the previous week. IFB’s market cap gained $590.3 million or 1.7% to reach $36.24 billion. Its First Market witnessed the trading of 54 million securities valued at $2.3 million, indicating a 46% and 52% uptick in the number of traded securities and trade value respectively. About 348 million securities valued at $16.5 million were traded in the Second Market, with the number of traded securities and trade value dropping by 5% and 29% respectively week-on-week. Over 7 million debt securities valued at $150.9 million were also traded at IFB, growing by 17% and 23% in the number of bonds traded and their value respectively. Exchange-traded funds were down 21% in trade number and 31% in value to reach 16 million worth $5.16 million. Housing mortgage rights’ trade reached 30,000 securities worth $5.02 million, marking a drop of 15% and 12% respectively.